If you have a rear-wheel drive vehicle, your differential is on the back axle. With front-wheel drive cars, the differential is up front. All-wheel drive and 4-wheel drive vehicles have three differentials – front, rear and in the middle. So you see, you’ve got a differential (or two or three) and it needs service now and then. The inside wheel travels about 12.6 feet/3.8 meters. How much farther does the outside wheel travel? About 18.8 feet/5.7 meters – over 6 feet/1.9 meters more. This means the outer tire has to rotate 9 times in the same amount of time that the inner tire has to rotate only 6 times – so the outer tire has to spin faster in order to keep up. The differential makes this possible. The gears in the differential are cooled and lubricated by differential fluid. It is this fluid that needs to be serviced. 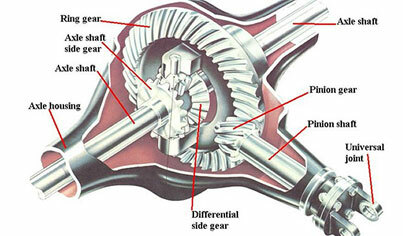 Small bits of the gears break off and are suspended in the differential fluid. The dirtier the fluid, the faster the gears wear. So your Falmouth Motorcar technician drains the old fluid out and replaces it with fresh fluid. Some differentials also need a special additive that is put in at this time. So when should you have your vehicle differential serviced? Intervals vary from vehicle to vehicle – and may be as short as 15,000 miles/24,000 km – so check your vehicle owner’s manual or ask us at Falmouth Motorcar. If you frequently drive with heavy loads, tow a trailer or drive in hot MA conditions, you may need to change differential fluid more often. Servicing your differential on schedule at Falmouth Motorcar can save a pricey replacement down the road.